In a world first, at the 67th IAA International Motor Show for commercial vehicles in Hanover (20- 27 September) Valeo unveiled a revolutionary rooftop air conditioning system for electric buses. 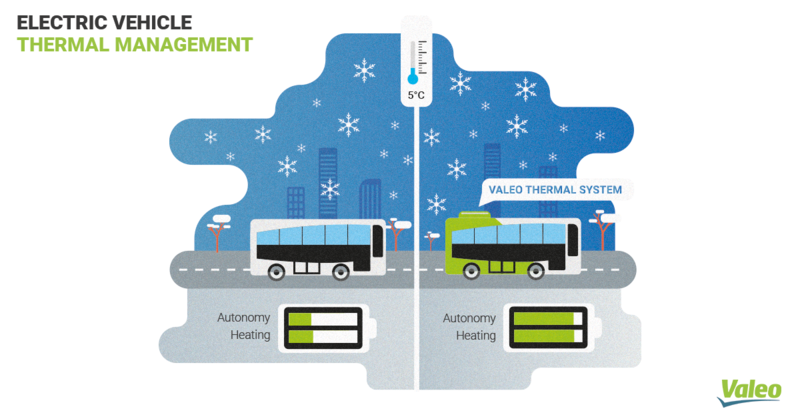 Did you know that in urban driving conditions in winter, a bus operating in all-electric mode uses similar amounts of energy to heat the cabin as it does to drive? To solve this conundrum, Valeo has created a system, unique in the world, based on heat pump technology. The Valeo REVO-E pro air conditioning system features a fully automatic de-icing mode that keeps the heat pump operating at temperatures as low as -15°C. Not only does it deliver highly efficient heating, it has a very positive impact on the electric bus’ driving range.